“Every month, JPMorgan Chase dispatches a researcher to several supermarkets in Virginia. The task is to comparison shop for 31 items. • Oct. 8: For a second month running, the Agriculture Department cut its forecast for US corn production. The USDA predicts a 3.4% decline from last year. Damage done by Midwestern floods in June was made worse by hot, dry weather in August. America’s been blessed with year after year of “record harvests,” depending on how you measure it. So when crisis hits elsewhere in the world, the burden of keeping the world fed falls on America’s shoulders. So what happens when those “record harvests” no longer materialize? In September, the US Department of Agriculture estimated that global grain “carryover stocks” – the amount in the world’s silos and stockpiles when the next harvest begins – totaled 432 million tons. That translates to 70 days of consumption. A month earlier, it was 71 days. The month before that, 72. At this rate, come next spring, we’ll be down to just 64 days – the figure reached in 2007 that touched off the food crisis of 2008. But what happens if the U.S. scenario is worse than a “nonrecord” harvest? What if there’s a Russia-scale crop failure here at home? That was the story in 2008. It’s becoming the story again now. It may go away in a few weeks or a few months. But it won’t go away for good. It’ll keep coming back…for decades. There’s nothing you or I can do to change it. So we might as well “hedge” our rising food costs by investing in the very commodities whose prices are rising now…and will keep rising for years to come. So how do you do it? As recently as 2006, the only way Main Street investors could play the trend was to buy commodity futures. It was complicated. It involved swimming in the same pool with the trading desks of the big commercial banks. And it usually involved buying on margin – that is, borrowing money from the brokerage. If the market went against you, you’d lose even more than your initial investment. Nowadays, an exchange-traded fund can do the heavy lifting for you, no margin required. The name of the fund is the PowerShares DB Agriculture ETF (DBA). So you have a mix here of 50% America’s staple crops of corn, beans, wheat and sugar…25% beef and pork…and 25% cocoa, coffee and cotton. It might not be a balanced diet (especially the cotton), but it makes for a good balance of assets within your first foray into “ag” investing. The meat weighting in here looks especially attractive compared to some of DBA’s competitors, which are more geared to the grains. It takes about six months for higher grain prices to translate to higher cattle and hog prices. “The world food situation is starting to get very, very tight. Unprecedented heat and wildfires this summer in Russia and horrific flooding in Pakistan and China have been some of the primary reasons for the rapidly rising food prices we are now seeing around the globe. In places such as Australia and the African nation of Guinea-Bissau, the big problem for crops has been locusts. In a world that already does not grow enough food for everyone (thanks to the greed of the elite), any disruption in food production can cause a major, major problem. Tonight, thousands of people around the world will starve to death. So what happens if things get even worse? Many agricultural scientists are now warning that global food production is facing dangers that are absolutely unprecedented. Crop diseases such as UG99 wheat rust and the “unintended effects” of genetic modification pose challenges that previous generations simply did not have to face. The outbreak of a real, live global famine looks increasingly possible with each passing year. So are you and your family prepared if a global famine does strike? Already, there are huge warning signs on the horizon. 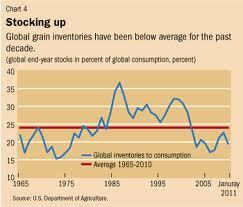 Just check out what agricultural commodities have been doing. They have been absolutely soaring. A recent article on the Forbes website noted a few of the agricultural commodities that have skyrocketed during this year…. Are you ready to pay 84 percent more for a loaf of bread? You better get ready – these raw material prices will filter down to U.S. consumers eventually. So what is going to happen if the world food situation gets even tighter? You don’t think that it can happen? UG99 is commonly known as “wheat rust” or “stem rust” because it produces reddish-brown flakes on wheat stalks. The International Maize and Wheat Improvement Center in Mexico believes that approximately 19 percent of the global wheat crop is in imminent danger of being infected with UG99. Ultimately, it is estimated that about 80 percent of the wheat on the globe is capable of catching the disease. This current strain of wheat rust was discovered in Uganda in 1999 and has spread into areas of Kenya, Sudan, Ethiopia, Yemen and Iran. It is feared that this crippling disease will spread even farther into south Asia, devastating the fertile growing regions of Afghanistan, Pakistan, India and Bangladesh. If that happens, you might as well kiss world food stability goodbye. Verticillium Wilt is a fungus that prevents lettuce from absorbing water, causing it to quickly grow yellow and eventually wilt. This dangerous fungus is very hard to get rid of totally because it can stay in the soil for up to seven years. Today, Verticillium Wilt is spreading all over Monterey County, California. Considering the fact that Monterey County produces more than 60 percent of the lettuce in the United States, that is very bad news. In 2009, a disease known as “late blight” attacked potato and tomato plants in the United States with a ferocity never seen before. According to a press release from Cornell University, late blight had “never occurred this early and this widespread in the U.S.” when it started showing up all over the place early last year. Late blight begins as ugly brown spots on the stems of potato and tomato plants, and as the spots increase in size, white fungal growth develops until finally a soft rot completely collapses the stem. This was the disease that was responsible for the Irish potato famine in the 1850s. A major new outbreak could occur without warning. While it may or may not technically be a disease (depending on how you look at it), genetic modification is having a very serious affect on crops around the globe. For example, about 10 years ago Chinese farmers began to widely adopt Monsanto’s (MON) genetically modified Bt cotton. Researchers have found that since that time, mirid bugs that are resistant to the Bt pesticide have experienced a complete and total population boom. Today, six provinces in Northern China are experiencing what can only be described as a “mirid bug plague”. Mirid bugs eat more than 200 different kinds of fruit, vegetables and grains. Chinese farmers in the region are completely frustrated. In the United States, a different problem is developing. The complete and total reliance of so many U.S. farmers on Monsanto’s Roundup herbicide has resulted in several varieties of glyphosate-resistant “superweeds” developing in many areas of the United States. The most feared of these “superweeds”, Pigweed, can grow to be seven feet tall and it can literally wreck a combine. Pigweed has been known to produce up to 10,000 seeds at a time, it is resistant to drought, and it has very diverse genetics. Superweeds were first spotted in Georgia in 2004, and since then they have spread to South Carolina, North Carolina, Arkansas, Tennessee, Kentucky and Missouri. In some areas, superweeds have become so bad that literally tens of thousands of acres of U.S. farmland have actually been abandoned. One of the most frightening things about genetic modification is that it actually reduces that amount of crop diversity in the world. For example, if nearly all farmers start using the same “brand” of genetically modified plants that are all virtually identical, it sets up a situation where crop diseases and crop failures can cascade across the planet very easily. Genetic variety is a very desirable thing, but today our scientists are just doing pretty much whatever they want without really considering the consequences. It has been said many times that genetic engineering is similar to “performing heart surgery with a shovel”. The truth is that we just do not know enough about how our ecosystems work to be messing around with them so dramatically.